OMG. [Blushing smiley!] This is really humiliating and humbling -- not just to have my grammatical error noticed by a non-native-English speaker, but especially THAT particular grammatical error, which always always makes me scoff when other people make it! And native English speakers make it all the time. I always think, "Duh, if you took the 'brother' and 'sons' out of the sentence, would you say 'My step-mother took I out to lunch?' No? Then what's your problem??" I guess the error is common because people with REALLY bad grammar are likely to say "Me and my brother took my step-mother out to lunch." So teachers harp on the fact that it should be "My brother and I." So then people, trying too hard to be correct, stick with "I" even when "I" is the object of the sentence rather than the subject. In my case, the only excuse I can offer is that it was 1:30 a.m. and I'd had a lot of wine with dinner. We're on the same wave-length, Katherine! I never had had cassoulet before, but I could see making it a tradition on New Year's. I think Jack and Ennis would have gone for it, too. Your dinner sounds delish. What exactly is krumkake? Don't worry about the grammatical error! I think the late hour and the wine are a perfectly valid excuse. Kudos to Chrissi, though, for making her English studies count. Love reading about your and John´s new tradition. Sounds like a great time and great food and drinks were being had! Thanks for the ling to the Australian coffee place, Meryl. I remember wondering about that a while back and exactly where it was located. Yeah, the Scotch ice cream was interesting--kind of had a smoky taste. Glad I could help out with the link. Happy New Year to you, too, Monika! Krumkake is (are?) a crunchy Swedish cookie, lightly flavored with cardamon. Imagine a really flat pancake made in a press like a waffle iron with an elaborate flowery design, then rolled into a cylinder maybe 1 to 2 inches in diameter. My friend received a krumkake iron for Christmas from her family, so she made them, as well as the flan. 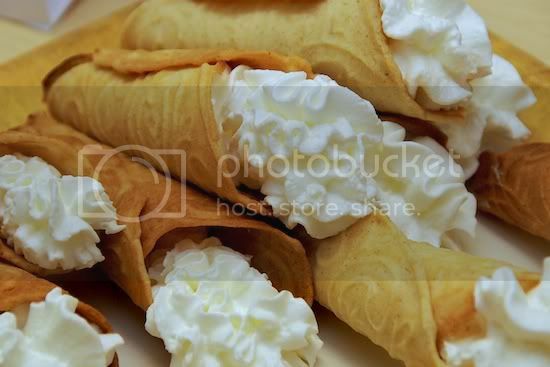 She filled them with whipped cream, making them a little like Swedish cannoli. I never stop being astounded by the English skills of our EuroBrokies. But to give you your confidence back: I read this particular error so many times that I started to question myself, and my English teachers. When I saw you (of all people) writing it this way, I was halfways convinced it must be correct. If Katherine writes [whatever] it must be corrrect English. That's how much confidence I have in your language skills. One error doesn't take from it. We're all human, even pro writers. Exactly! That's what I was always thinking. That's two excuses and they're both valid, if you ask me. It sounds delicious. But it doesn't sound Swedish . The word 'krumkake' sounds Norwegian to me. If it's indeed Swedish, it's a dialectal word that I've never heard of. The way you describe them being made is traditional here in some parts of the country, not sure they used to be filled though. And what the hell is Swedish cannoli??? New Year's Eve was at my friends' house, Tina and Bill. I got there about 8:00, and just hung out, ate, drank talked, laughed, and watched the ball drop at midnight. After that, we went onto their porch and started shouting, banging pots and pans, whistling, and shooting off some fireworks. To me krumkake sounds like krummholz. krum might derivate from krumm (=twisted, winded, curved, not straight). Or it might derivate from Krumen, Krümel (= crumbs). A winded cake or a dry, and thus friable cake. Krumkake or 'Krum kaka' (English pronunciation: /ˈkruːmkɑːkə/, meaning bent or curved cake, plural krumkaker) is a Norwegian waffle cookie made of flour, butter, eggs, sugar, and cream. Krumkake are traditionally made during the Christmas season. A special decorative two-sided iron griddle, similar to a waffle iron, is used to bake the thin round cakes. Older irons are used over the stove, but modern electric irons offer the convenience of nonstick surfaces, automatic timing, and multiple cakes per batch. While hot, the 13–20 cm krumkake are rolled into small cones around a wooden or plastic cone form. 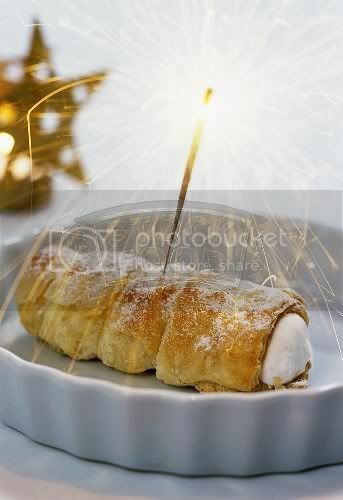 Krumkake can be eaten plain or filled with whipped cream (often multekrem) or other fillings. These cookies are popular not only in Norway but also among Norwegian immigrant descendants in the American Midwest. Krumkaker are traditionally made in preparation for Christmas, along with other Norwegian sweets including Sandbakelse and Rosettes. They offer a sweet dessert after the traditional Christmas Eve dinner of ribs or pinnekjøtt. In Germany, the cookies are commonly filled with sweet stuffings. 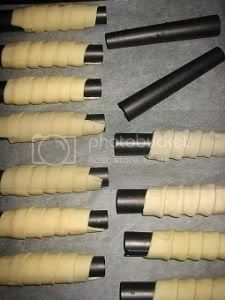 They are also used as a type of ice cream cone.